I’m in Portland at the moment where Halloween season is in full swing. Back when I lived in the city, I tried and failed to get someone to go to Fright Town with me. It was practically an annual tradition. “Hello, family member and/or friend. Would you like to go to the Pacific Northwest’s finest annual Halloween extravaganza with me?” “No, that place is probably swarming with obnoxious teenagers” or “it’s too expensive” were the replies I typically received. My girlfriend relented last night and we fought through the crowds at the Blazers’ home opener to get down there. 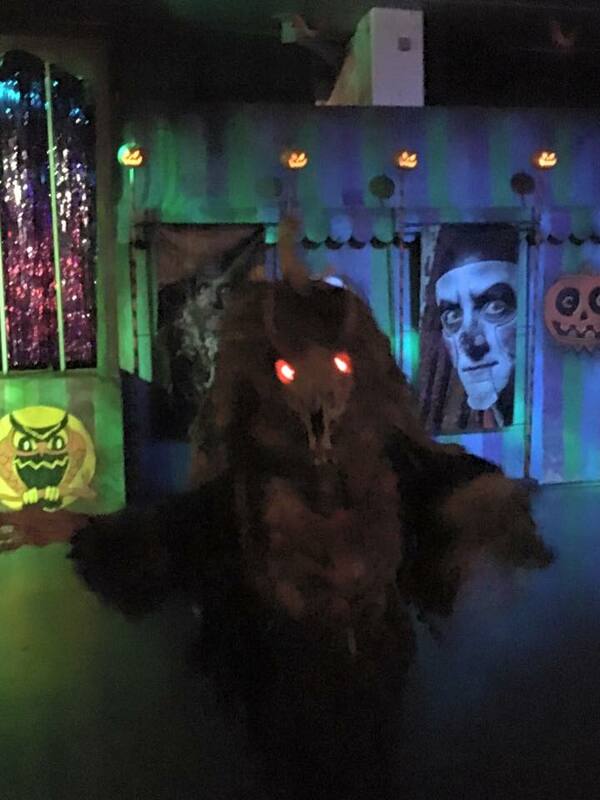 Fright Town is an annual Halloween event in the basement of the Memorial Coliseum that features a series of haunted houses and people running around in elaborate monster costumes (like the one below, who was eager to dance with anyone and everyone). The highlight is a Baron Von Ghoolo’s, an Addam’s Family-style museum/freak show. 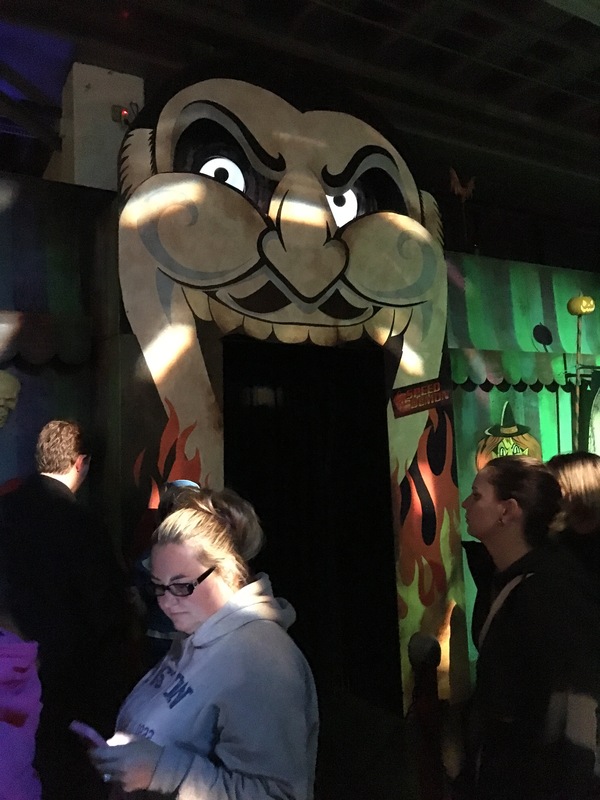 BVG’s favors cheeky humor over outright scares so guests here will find stuffed “were-pugs” and clowns instead of rampaging witches and zombies. Gentrification and problems with affordable housing are huge in Portland right now but it was still surprising to see a section of BVG’s devoted to such a heavy topic. In one room, a guy dressed as vaudeville barker screams things at guests like “SOON THIS TOWN WILL BE MORE EXPENSIVE THAN SAN FRANCISCO!” and “THERE WILL ARTISINAL COFFEE SHOPS IN EVERY HOUSE, AS MANDATED BY LAW!” Honestly, I found him about 1,000% scarier than the ghouls over in the Cannibal Cannery, the more conventional haunted house across from the museum. The crew even added a snarky banner to the room that thanked “The Brownstein and Armisen Alliance” for their sponsorship. I don’t think it’s fair to place all the blame at the feet of the duo behind Portlandia. Nobody moves across the country because of a sketch comedy show. Nevertheless, with each passing year, Portland becomes less and less the town of my youth and “Yet Another Overpriced American Metropolis.” As so many others have noted about a million times over the past five years, the freaks and artists are all moving on to different climes to repeat this whole process all over again. Every other article in The Portland Mercury is devoted to the topic and last week’s cover story in WW hit the nail on the head pretty well. What’s the next American city to get bit by the gentrification zombie? My money’s on Fort Collins.